A Texas favorite during happy hour, Superbowl Sunday and pot lucks. Prep Time: 15 to 30 Minutes, depending on if you use prepared guacamole and re-fried beans or homemade. 1 package prepared Guacamole or homemade. 1. Prepare guacamole according to package directions or make your own (2 avocados mashed with a fork, seasoned with salt, pepper, garlic powder, lime squeeze, hot sauce) and set aside. 2. 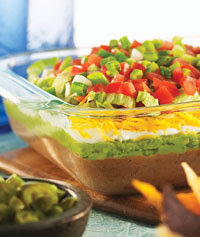 Spread beans on the bottom of a 2-quart glass baking dish and top with layers of guacamole, sour cream, cheese, lettuce, tomatoes, and onions and jalapenos, if desired. 3. Serve with corn chips. An assortment of Blue, white and yellow corn chips is a nice touch.